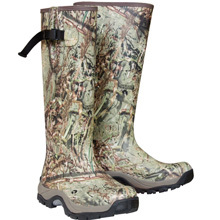 The EST Mudder Knee Boots have uninsulated rubber construction for comfort on warm early season hunts. The tough rubber shell provides durability in tough terrain and complete waterproof protection. Drake's Mudder™ boots and shoes deliver unmatched comfort, durability, and stability like none other on the market. The D2D Comfortrac System™ ensures a great fit and all-day comfort from the first shot of the day to the last ray of legal shooting light. Our athletic traction sole provides dependable grip and stability in all terrain, with a varied lug pattern that helps transition quickly from soft, muddy ground to hard, dry surfaces. The self-cleaning lugs easily shed off mud and help prevent it from caking on as you walk, earning these boots the Mudder name. Each model has a durable rubber armored upper with warm, comfortable neoprene lining. As the old saying goes, walk a mile in our shoes and we know you will feel the difference. Specifications: Rubber upper, Uninsulated, Athletic traction sole, Calf adjustment and Regular Width.